Plants forming dense clones. Roots arising at nodes. Petioles 1--18 cm, sparsely pubescent. Pinnae 2--17 × 1--16 mm, sparsely pubescent to glabrous. Sporocarp stalks recurved or prostrate, unbranched, attached at base of petiole, often hooked near apex, 3--11 mm. Sporocarps perpendicular to strongly nodding, underground or below stem level (all other species have sporocarps above stem level), 4--6 × 2.5--5 mm, 2.1--3.2 mm thick, rectangular to round in lateral view, covered with pelt of shaggy hairs but eventually glabrate; raphe 0.8--1.4 mm, proximal tooth 0.2 mm or absent, distal tooth absent or a broad bump 0.1 mm. Sori 14--22. Marsilea ancylopoda is not currently known to be extant in the flora; it was known at least at the turn of the century from a single locality in peninsular Florida. 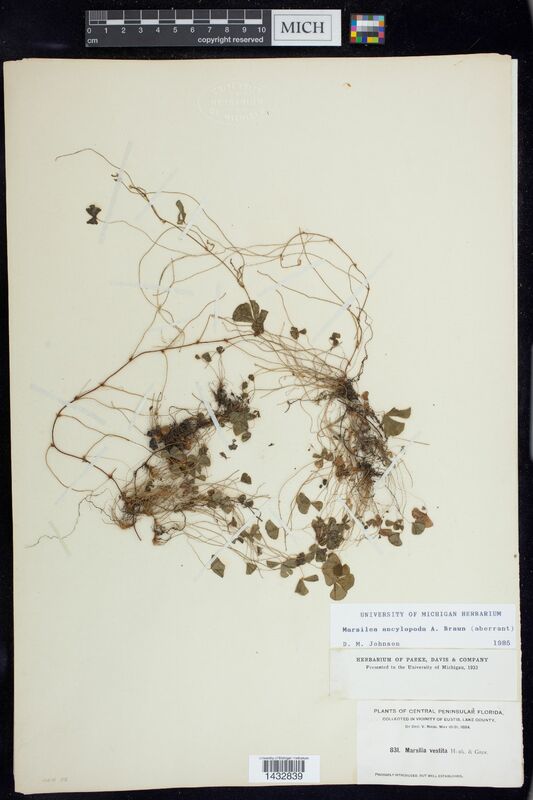 Other collections from Florida are M . vestita , are of questionable identity or have not been seen by the author. The subterranean sporocarps of M . ancylopoda are unique among the New World species of the genus.